Camping for free in Vancouver isn’t as easy as pitching your tent wherever you feel like it. You have to work for these free camping sites! Most of the free options are limited to backcountry or wilderness camping. So, you’re going to have to poop in the woods. If that’s no problem (and let’s face it, pooping in the woods is sometimes better than going in an over-used outhouse), then check out some of the free camping options in and around Vancouver. Be prepared and don’t get lost/die! For this option of free camping in Vancouver, you’re going to need to splurge a bit on a sea kayak or canoe. Either you can rent one in Deep Cove (around $100 for overnight), or if you have a way to carry them on a car, you can rent them from MEC for a much more decent price (around $45 per day). One of the best places to go is Granite Falls, which has an awesome waterfall that you can swim in and a nice beach. Camping is only allowed on the South of the waterfall. This place is pretty popular with day-trippers, but can clear out in the middle of the week or later at night. It takes around 3-6 hours to kayak there. Here’s a great map of other camping locations around Indian Arm. When you’re on crown land (area belonging to the monarch) this is considered public and you are able to camp wherever you want. There is no official list of all the crown land in Vancouver, but if there is no “Private” or “No Trespassing” signs where you are, there is a good chance you are on crown land. Make sure you are not in a National Park, and you should be fine to camp wherever you see fit. This kind of camping comes with responsibility. Always practice no-trace camping and respect others around you (including wildlife). 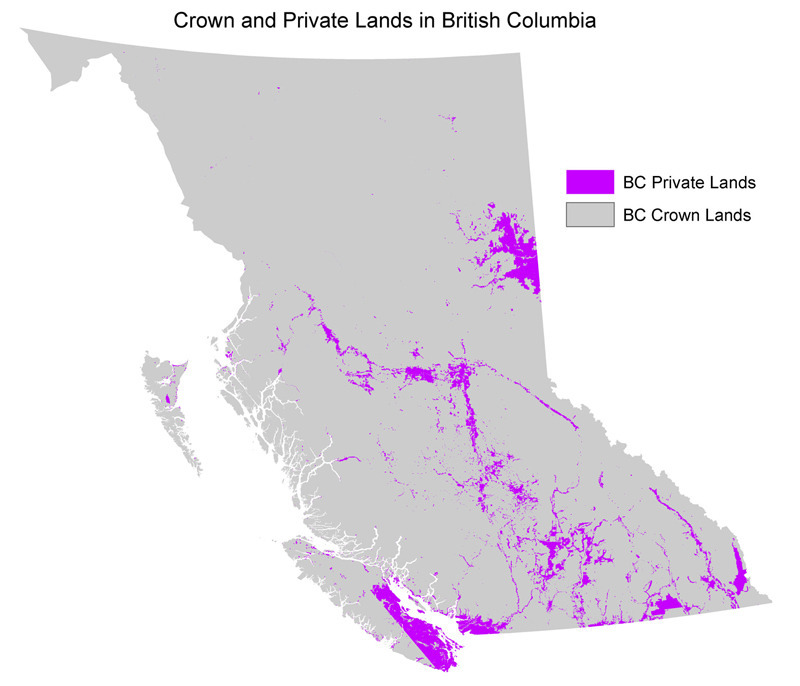 94% of BC is Crown Land, check out this map highlighting areas of private vs. public land. ** REMINDER: This information is a privilege. Practice no-trace camping. Always be prepared. Don’t mess things up for everybody. Don’t leave garbage where you camp. Don’t burn down the forest. Be safe, not a statistic! One guy Robaire says the British do not control crown land. Nothing is farther from the truth. Just look at Canadian oil control by BP and American oil companies. Then all those government jobs given away to East Indians with Canada paying their medical bills for aging grandparents and free pension. it belongs to the folks who live here, work were and pay taxes here. it is only “managed” by the local governments on behalf of the people. Promoting bad practice. Stop giving spots away and telling people they can camp anywhere. This is why search and rescue has been so busy the last couple years. Camping is not allowed in Lynn Headwaters Regional Park, including backcountry areas of the park. Cypress Mountain Camping, looks an adventure place to have camp. I’d like to go there someday. The amazing part in this place is the no pay camp at this place. Fantastic area.